Is Talend S.A. (NASDAQ:TLND) A Good Stock To Buy? Is Talend S.A. (NASDAQ:TLND) undervalued? Prominent investors are turning bullish. The number of bullish hedge fund bets advanced by 7 lately, and there were 22 hedge funds long the stock at the end of September. In spite this increased enthusiasm for the company, the number of bullish investors was quite small for it to make it as one of the 30 most popular stocks among hedge funds in Q3 of 2018. In any case, we would like to examine this stock furthermore to determine how much potential it carries. At the annual Sohn conference in San Francisco, held in October, Mark Desio from Lucha Capital Management talked about his views on Talend S.A. (NASDAQ:TLND). As reported on CNBC, Mark Desio encouraged investors to buy Talend for “its role as an enterprise company”. 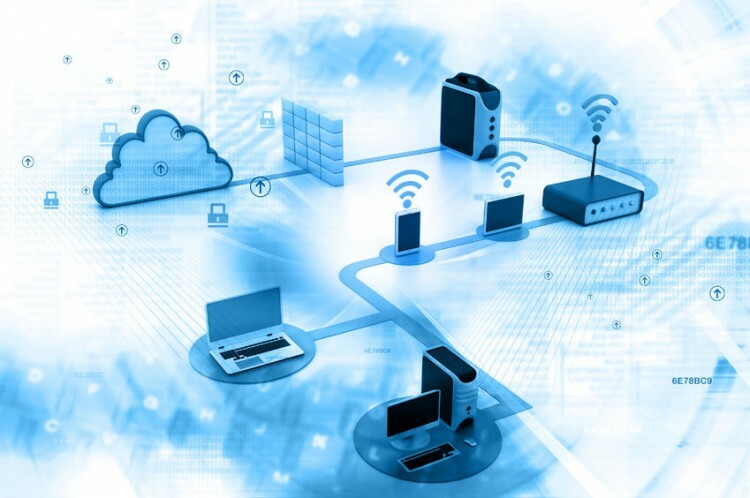 He holds the opinion that companies like Talend will become more needed in the future, forecasting the company’s shares to reach $105 by 2020, and seeing it as a possible acquisition target. Mark Desio also praised the company’s board of directors. At the moment there are tons of signals stock traders have at their disposal to assess publicly traded companies. A duo of the most underrated signals are hedge fund and insider trading activity. We have shown that, historically, those who follow the top picks of the top money managers can outpace the market by a solid margin (see the details here). Let’s go over the key hedge fund action surrounding Talend S.A. (NASDAQ:TLND). What does the smart money think about Talend S.A. (NASDAQ:TLND)? At Q3’s end, a total of 22 of the hedge funds tracked by Insider Monkey held long positions in this stock, a change of 47% from one quarter earlier. 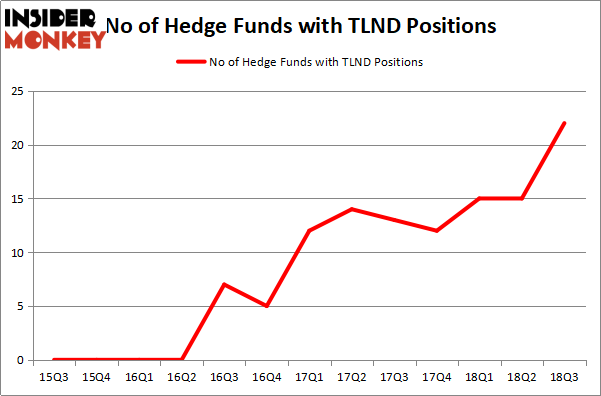 On the other hand, there were a total of 12 hedge funds with a bullish position in TLND at the beginning of this year. So, let’s see which hedge funds were among the top holders of the stock and which hedge funds were making big moves. When looking at the institutional investors followed by Insider Monkey, Whale Rock Capital Management, managed by Alex Sacerdote, holds the largest position in Talend S.A. (NASDAQ:TLND). Whale Rock Capital Management has a $106.4 million position in the stock, comprising 2.4% of its 13F portfolio. The second most bullish fund manager is David Goel and Paul Ferri of Matrix Capital Management, with a $67.9 million position; 1.7% of its 13F portfolio is allocated to the company. Some other members of the smart money with similar optimism comprise Kevin Oram and Peter Uddo’s Praesidium Investment Management Company, Dennis Puri and Oliver Keller’s Hunt Lane Capital and Amish Mehta’s SQN Investors. As industrywide interest jumped, specific money managers were breaking ground themselves. Praesidium Investment Management Company, managed by Kevin Oram and Peter Uddo, established the largest position in Talend S.A. (NASDAQ:TLND). Praesidium Investment Management Company had $67.4 million invested in the company at the end of the quarter. Bruce Garelick’s Garelick Capital Partners also initiated a $43.9 million position during the quarter. The following funds were also among the new TLND investors: Paul Marshall and Ian Wace’s Marshall Wace LLP, Alok Agrawal’s Bloom Tree Partners, and Ryan Frick and Oliver Evans’s Dorsal Capital Management. Let’s now review hedge fund activity in other stocks similar to Talend S.A. (NASDAQ:TLND). These stocks are Bed Bath & Beyond Inc. (NASDAQ:BBBY), Carrizo Oil & Gas, Inc. (NASDAQ:CRZO), Kayne Anderson MLP/Midstream Investment Company (NYSE:KYN), and Atlantica Yield plc (NASDAQ:AY). All of these stocks’ market caps resemble TLND’s market cap. As you can see these stocks had an average of 17 hedge funds with bullish positions and the average amount invested in these stocks was $179 million. That figure was $569 million in TLND’s case. Bed Bath & Beyond Inc. (NASDAQ:BBBY) is the most popular stock in this table. On the other hand Kayne Anderson MLP/Midstream Investment Company (NYSE:KYN) is the least popular one with only 3 bullish hedge fund positions. Talend S.A. (NASDAQ:TLND) is not the most popular stock in this group but hedge fund interest is still above average. This is a slightly positive signal but we’d rather spend our time researching stocks that hedge funds are piling on. In this regard BBBY might be a better candidate to consider a long position.